I can't remember exactly when I started to collect decorative tins but I have been using them for as long as I can remember. Retail stores usually have them on sale mid-summer. Thrift stores also often offer a variety of new and pre-used tins that can be easily re-purposed. When choosing tins, check that you can easily remove the lid. Also make sure there are no bumps or dents on sides, and no rust anywhere but especially on the inside. I try to keep several tin sizes on hand, as well as simple tins without any decorations so they can be used for a number of occasions. Tins are a great way to ship cookies so they don't break. 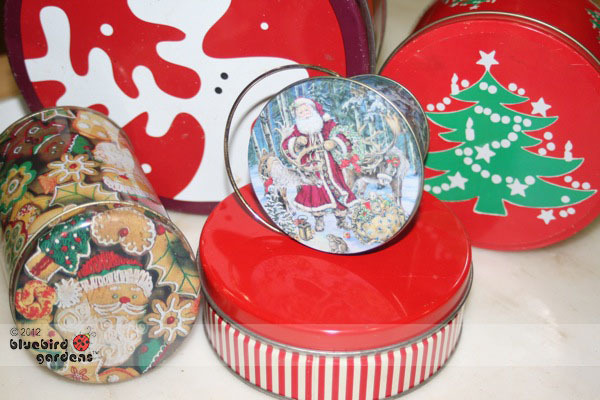 You can also use tins to store cookies for school and office parties. If for some reason the tin is not returned, it's not much of a loss. I have also inherited some nice tins from cookie exchanges. Once empty, I run them through the dishwasher and immediately remove to hand dry with muslin dish towels. That helps to prevent rusting and gives me a chance to think about how I can best use those tins again!